I’m in a quandary, dear viewers. It is tearing me apart. Do I love cherry, strawberry or raspberry beer the best? Regular visitors to the Haus of FGV will be all too familiar with the relationship I am fostering with the good folk up in Tadcaster known as the Samuel Smith Brewery. These traditional ale, lager, cider and beer producers have been turning out the liquid good stuff since approximately 1758. They are the last remaining independent brewery in the town of Tadcaster and the majority of what they create is suitable for vegans. You will often find me frittering away an afternoon in one of the 300 or so Samuel Smith pubs scattered around the UK. Give me a pint of Cider Reserve and my woes are temporarily dismissed… and I’m rather pleasant company. Well, the Sam Smith news gets better. 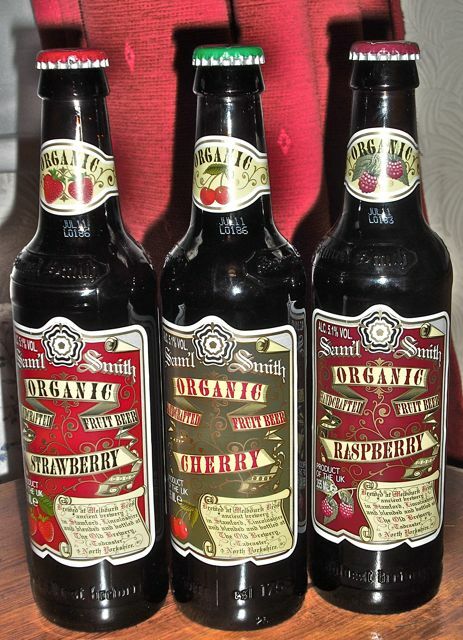 During a recent whimsical shopping expedition to As Nature Intended on the Chiswick High Street, I was delighted to discover organic fruit beer by Samuel Smith. With three bottles under my arm, I waddled home to impatiently wait for them to chill. The wait was more than worth it. These beers are fresh, fruity and flavourful. Each variety was delicious and I am at a loss to name a clear winner. If I can’t choose a favourite, it is obvious I must always buy this beer in a trio. Right? Hi! I saw your reply on Ricki’s website and just subscribed to your blog. Love everything about it! 🙂 Me? New vegan, obsessed with red wine, packing on some new vegan pounds and lovin’ it! I look forward to reading your posts! Hey. Thanks for the very kind words and for checking out my blog. Glad to have you reading.